The term insula refers to a small but highly important island of cerebral cortex located deep in the lateral fissure of primates. Its overall shape, as identified by dissection in the human, is that of a pyramid with an insular apex directed laterally and a triangular base adherent to the extreme capsule in a roughly vertical plane. The boundaries of the insula are defined largely by the limiting sulcus. In the human it is separated from the superior temporal gyrus by the inferior limiting sulcus; separated from the rostral parietal lobe and inferior frontal gyrus by the superior limiting sulcus; and from part of the orbital gyri by the anterior limiting sulcus.The portions of the lobes that cover it are, correspondingly, the temporal operculum, the parietal operculum and the frontal operculum. The remaining rostral boundary of the insula is less distinct. Its rostrolateral junction with the temporal lobe is with the piriform area in the limen insula, and its rostromedial junction with the frontal lobe is through the transverse insular gyrus to the orbital gyri. Topologically the insula of the human consists of two parts separated by the central insular sulcus: the larger anterior insula and the smaller posterior_insula composed of the long insular gyri ( Ture-1999 ). In adult humans the insula of the left hemisphere is larger than that of the right ( Bamiou-2003 ). In macaques the relation of the insula to surrounding lobes is the same as in the human. The human insula, however, is further subdivided into seven or eight gyri, while that of the macaque is smooth except for the orbitoinsular sulcus. This small sulcus is found near the boundary of the insula with the orbital gyri and is not seen in the human ( Mufson-1997 ). The insula does not exist as a topological structure in rodents ( NeuroNames ). The most complex insula is found in cetaceans, such as the dolphin ( Mesulam-1984 ). The human insula's many sulcal landmarks have little relation to its internal structure. Architectonically it is segmented according to two different schemes: a three part scheme of granular insula, dysgranular insula and agranular insula ( Mesulam-1982; Zilles-2012 ) and an earlier four part scheme in which the dysgranular insula is divided into a more granular dysgranular insular cortex (Roberts) and a more agranular insular cortex (Roberts) ( Roberts-1963; Roberts-1970; Paxinos-2009a ). 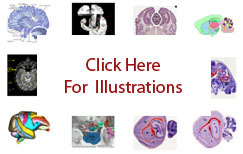 The areas of cerebral cortex in the rodent that are architectonically equivalent to the primate insula are the agranular insular area, the dysgranular insula ( gustatory cortex of the rodent), and the granular insula ( visceral cortex of the rodent ). The insula is involved in the integration of many sensorimotor, socioemotional, and cognitive functions including gustation, visceral sensations and olfaction ( Fig. 3 in Kurth-2010b ); somatosensation (touch, pressure, temperature, etc. ), as well as pain ( Fig. 4 in Kurth-2010b ); and attention, language, speech, and two forms of memory ( Fig. 5 in Kurth-2010b ).